Alerte à Malibu Penneshaw KI. Alerte à Malibu est idéal pour l'escapade parfaite. Il est une maison moderne de 3 chambres situé à Penneshaw avec vue sur l'eau et à travers le continent. Un balcon vous permet de vous asseoir dehors et profiter de la vue. La chambre principale a son propre balcon privé. Il est bushwalking à proximité ainsi que des courts de tennis publics et pour les enfants un skate parc récemment construit. La maison est située dans un cul-de-sac tranquille, très sûr pour les enfants à jouer, avec une belle aire de barbecue en plein air et d'espace pour se déplacer. Parking pour les voitures et bateaux sur place. Baywatch was exactly as all the previous reviews we had read. A perfect place with all amenities set in a beautiful location. Peaceful setting with an amazing view, and a quick stroll to a clean, sandy beach which our kids absolutely loved. We will be back. Jarrod and his family were great guests We would be very happy to host you anytime.Look forward to having you at Baywatch again Jarrod. On arrival, we were greeted by dolphins from the comfort of the lounge! The kids loved watching the ferry from the balcony and were entertained by the wallabies coming close for late night feeds. The property is extremely comfortable and provided us with everything we needed. Beautiful, quiet location, modern kitchen, bathroom, bedrooms and lounge topped with the wall of windows out the front made for a stay we're not going to forget. We didn't want to leave! Thankyou so much! Hi Amanda, Yes the dolphins are always a highlight when guests stay at Baywatch as they love to play in the bay right in front of the house. 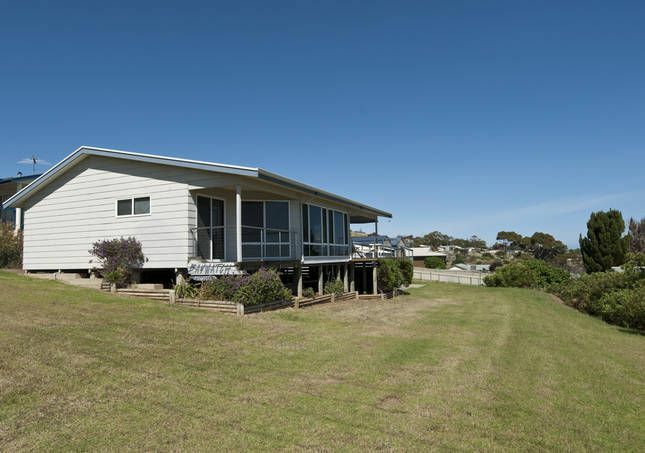 It is a great location with the ferry within walking distance, and the wallabies within view as well. I'm so glad you found the house comfortable and enjoyed the panoramic views as well. Thankyou for leaving the house clean and tidy. love the nature same the House very relaxing everynight we have visitor a wallyby! Had Big rain during our stay We was amaze how the owner rang just to ask how we doing if my family are ok in the island!! will be back next year in same house 2018!!! Thank you for allowing us to use your holiday home,just what we hoped for made our stay in K.I. that much better. We all enjoyed the sights of K.I. coming home after a long day having a cold drink and looking out over the water just stunning. We found Baywatch to be exactly what we required for our week on KI. It was conveniently located with an amazing view. The house was comfortable and had everything we needed. Plenty of beds to accommodate a large family. We will be recommending this holiday house to our family and friends without hesitation. This property has amazing views with room for the whole family! The kids loved daily walks to the beach and watching the ferry come and go. Owners were very accommodating. Overall a great location that we will recommend to friends.